Amazing. Loving. Strong. Happy. Selfless. Graceful. These are some of the words that describe mothers around the world. Mothers can often be underappreciated because all the focus is on the children most of the time, which is just how life works. Make sure that your mother or wife never forgets how appreciative and thankful you are for her selfless heart and caregiving attitude. There are a few days of the year that give mothers a chance to be pampered and have a day entirely focused on them, but I think most of us can agree that they should have more than that. A little surprise every once in awhile would make her heart skip a beat! Imagine that you (as the husband) walk into your house after a long day and give your wife a present while she is hard at work cooking dinner for your family. I can almost assure you that it would completely make her day, and maybe even her week! Most women love unplanned surprises. Whether it’s a cute handwritten note that she finds in her purse during the day, or a gorgeous bracelet that you come home with one day for no reason at all. “No reason” gifts are some of the best kind and will give all the husbands out there some major brownie points! Of course jewelry is always a wonderful gift for any woman, but you know what would make that gift even sweeter? Adding some personalization to it. Most women lead with their emotions and make stronger connections with physical items when there is a sentimental value. For me personally, infinity signs have sort of become “thing” between my sisters and I. We all wanted to get matching tattoos and after months of brainstorming, we finally decided to get an infinity symbol that say ‘sisters’ intertwined into it and since then, those symbols have become our signature symbol. Last Christmas, our mother got us all matching infinity necklaces and they honestly aren’t anything special but the meaning behind it means so much to all of us. I don’t live in the same state as my family (actually about 18 hours away) so whenever I wear my infinity necklace, it’s like I am reminded more of my connection with my sisters. Sentimental pieces like this with a special meaning behind them are the pieces that are cherished forever. With Nelle and Lizzy, you have the opportunity to design the perfect piece of jewelry for your mother or wife. Some of our most popular pieces are from our Mother’s Stackable Rings collection. All of our mother’s stackable rings are available in gold or silver and there are a ton of design options! Our gold rings are made of 14K gold vermeil, the silver ones are sterling silver and both can include Swarovski crystals. As a starting point to pick out jewelry for yourself or a spouse, it’s important to think about the metal color. Gold typically looks better on warm or tan skin tones and silver usually flatters cool skin tones with pink undertones. If you can’t figure out which metal “fits” you, you can find a more thorough explanation here. These rules definitely don’t have to be followed, it’s just an interesting take on how the colors look on different skin tones. For example, I am considered to have a cool skin tone, which means silver should look best on me but I wear a mix of both metals – gold and silver – and I love how both look on me. It’s just a matter of opinion and what you think looks best on you and your skin tone! After you’ve picked gold or silver for your mother’s stackable rings, get your creative juices flowing and design a personalized stackable ring set! You can make your stack as little or tall as you would like. As an example, for a mother with one child, instead of getting a single ring with her child’s initial, try adding another one with their birthstone gem, along with a symbol like a heart or cross. 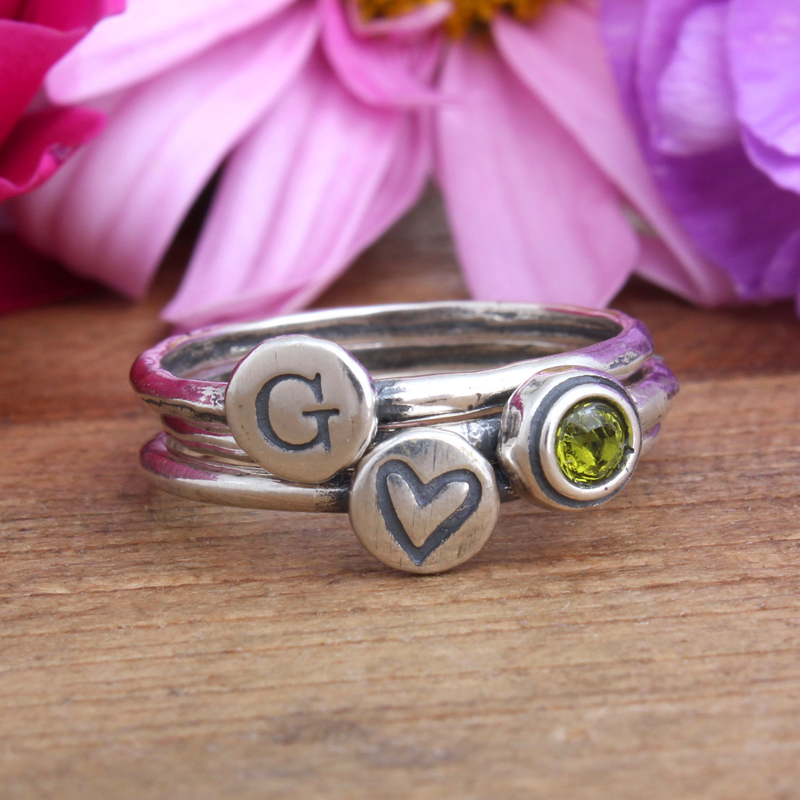 And voila, you have an adorable and meaningful collection of mother’s stackable rings! For a mother with more than one kiddo in her life, their stack may be a bit bigger! The mother’s stackable rings below would be perfect for a mom of four. This showcases the initials and birthstones of each one of her babies. To the ladies out there, you don’t have to wait for your man to buy you a mother’s stackable ring set either. You are a strong mom who deserves to pamper herself from time to time, so go ahead and personalize and order one for yourself! Why not, right? And If you’re the kind of woman who doesn’t like buying gifts for yourself, you can always throw hints to your hubby – tag him in one of our Instagram pictures that you love or mention him on Facebook to point him to the direction of our Nelle and Lizzy page. Add a little wink emoji with your message and we think he will get the hint. The loss of a loved one. You can get one for yourself if your mother passes and build your stack around what reminds you of her. Maybe her initial, birthstone and a cross. For your mother. The same idea goes for mom’s around the world as it does for wives. Surprises, small gifts, and “no reason” presents are perfect year-round. A push present. Is a friend or sister of yours having a baby soon? A mother’s stackable ring set would be the perfect push present for a new mom! A Mother/Daughter stack. Get a matching stack for you and your daughter, or build two different stacks to symbolize the love you have for each other. Let your mother or wife know how appreciative of her you are with a unique and perfectly tailored-for-her piece of jewelry. 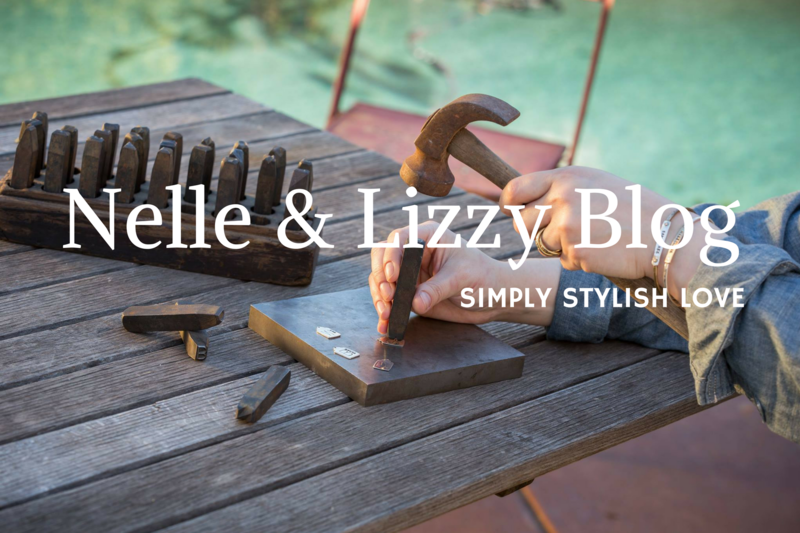 Nelle and Lizzy is passionate about creating personalized, hand-stamped jewelry and would love to make something special for you or a family member. We hope and wish that a piece from us will be passed down for generations and become an heirloom piece for you and your family! Our Mother’s Stackable Ring Collection is the perfect place to look if you’d like to add a special piece to your family history and show that special woman in your life how much they mean to you.